Back out with the Girls this morning - what a beautiful start to the day - nice and cool, slightly misty on the drive over to the forest and then the sun came up slowly, perfect for training. It was just warm enough not to have to wear gloves. Flint (the pup) has been off sick, having had an abscess, but he is back, fit and raring to go, so he gets to run along behind the teams. We took turns running with him today and I tried out one of Ali's patent human harnesses. He is so keen to run now that he will pull for quite a way. 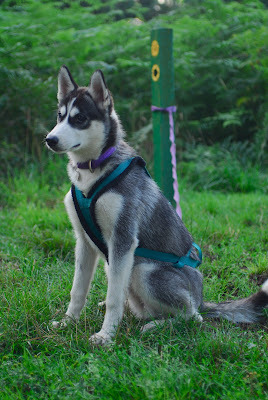 Here he is wearing his harness - I can't believe how much he has grown! I tried the human harness with my two on our run later, and it was comfy for me but their lead is too heavy for it and swung too much when they weren't pulling. I'll have to get Ali to work something out for me. Just a short run this morning as we have a busy day and starting training that bit later (4.30am now) has a knock on effect. Glad to hear training seems to be back ontrack. I do plan to give some, but will still have to wait a little bit.